Royal Wheels India is an adventure travel group organising Buddhist Circuit Tour Package in India. Morning transfer to railway station to board Shatabdi exp. for Lucknow , Arrive Lucknow , After lunch leave for Sravasti by road , Arrive Sravasti & transfer to hotel. Dinner and overnight at hotel. Morning leave for Bodhgaya - As the place of the Buddha's Enlightenment, Bodhgaya is the spiritual home of Buhddhists. It attracts tens of thousands of believers from all over the world. Bodhgaya situated near the river Niranjana, is one of the holiest Buddhist pilgrimage centres since it was here that Buddha attained enlightenment under the Bodhi tree, enroute visit Nalanda & Rajgir - Like many others in search of truth, Prince Siddhartha, after he renounced his royal heritage came to this city to seek the path of vation. . On arrival transfer to hotel. Dinner and overnight at hotel. Early morning boat ride on river Ganges. Breakfast at hotel. Later transfer to airport for flight to Kathmandu. Arrive Kathmandu & transfer to hotel. After lunch city tour of Kathmandu. Dinner & overnight at hotel. After breakfast visit to Patan City , Swyabhunath , golden temple & Bodhnath . Dinner & overnight at hotel. Transfer in time to airport for onward destination. Arrive Delhi. Overnight at Delhi at Sunstar Residency Hotel. Early morning transfer to New Delhi Railway Station to board the Shatabadi Express Train at: 0620 hrs. (breakfast on board) Arrive Lucknow at: 1245 hrs. Lunch at local restaurant in Lucknow. After lunch proceed to Saravasti and sightseeing of Sahet-Mahet. Evening check-in at hotel Pathik Niwas and overnight at hotel. After breakfast drive to Lumbini via sightseeing of Kapilvastu. On arrival check in at hotel. Afternoon sightseeing of Lumbini visiting Maya Devi Temple & Ashok Pillar etc. Overnight at Yeti hotel. Drive to Kushinagar. Lunch at hotel. 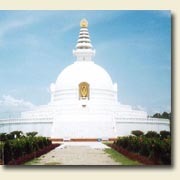 Afternoon sightseeing of Kushinagar visiting Mahaparinirvana, Thai Temple & Ramabhore etc. Overnight at hotel Pathik Niwas. Drive to Patna via sightseeing of Vaishali with box lunch. Overnight at hotel Maurya Patna. This morning after breakfast drive to Bodhgaya via sightseeing of Nalanda( sightseeing of Ruins of Nalanda University) & Rajgir (sightseeing of Banboo Garden, Bimbsara prison & Girdhkoot etc.). Lunch at Rajgir restaurant. After lunch continue drive for Bodhgaya. Arrive Bodhgaya in the evening and check-in at hotel. Overnight at hotel Sujata or Delta. Full day sightseeing of Bodhgaya. Visiting places like Mahabodhi Tree and Main Temple, Monestries and Niranjan River. Overnight at hotel Sujata or Delta hotel. Drive to Varanasi. Arrive Varanasi at:1300 hrs. On arrival transfer to hotel and lunch at hotel. Afternoon sightseeing of Sarnath & Museum. Overnight at hotel Hindustan International hotel. Early morning visit to River Ganges(at:5AM) to see sunrise and boat ride. Back to hotel for breakfast and than city sightseeing and Banaras Hindu University. Evening catch train for Agra. Overnight Train Journey. Arrive Agra early morning. On arrival transfer to hotel for check-in and breakfast. Morning sightseeing of Taj Mahal & Agra Fort. After lunch City sightseeing and shopping etc. Overnight at hotel Kant. Drive back to Delhi. Afternoon sightseeing of Delhi and visiting places like Laxmi Nayran Temple, india Gate, Raj Ghat etc. Evening sound and light show programme at Red Fort. Overnight at hotel Sunstar Residency. After breakfast again sightseeing of Delhi and visiting - Qutab Minar & Lotus Temple. Lunch at local restaurant. Free at leisure. Evening transfer to International Airport to catch flight for onward destination.